Our technology offering is tried and tested, providing best in class service in the areas of 360-degree feedback, employee engagement surveys and customer satisfaction surveys. Having worked with more than 200 clients in the last 12 years, our technology solution is both cost effective and highly customized to meet your specific needs. 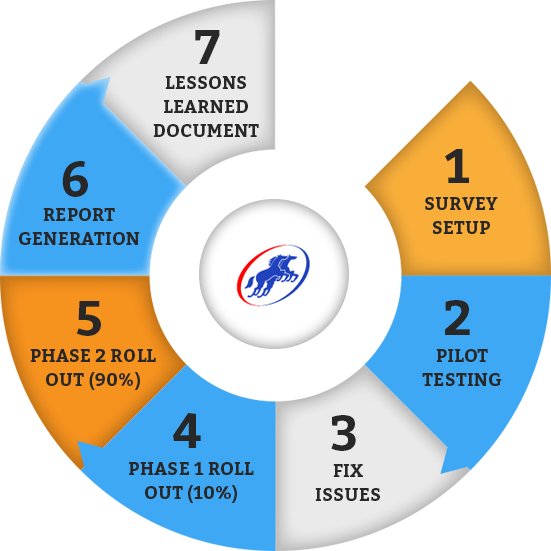 Our simple, but well-defined 7-step survey project management process helps mitigate several common risks that occur when rolling out a feedback initiative across a large organization. Built-in administrative functionality to send emails, reminders and status notifications. User option to save/edit/delete and modify options before submitting. Scalability supports 1000's of users. Low Total Cost of Ownership (TCO) balances customized IT functionality with low cost. SAP compliant data import and export. Detailed training provided on all technical aspects.